The GET BC-007-T Tahoe™ bouillon cup gives tabletops a natural look with its sandstone color. Made of melamine, the bowl is break resistant, BPA free, and can withstand temperatures from -20 to 200 degrees Fahrenheit, so it can be used to serve everything from ice cream to soup. It can also safely be cleaned in commercial dishmachines. 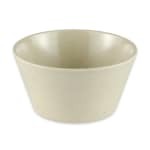 The GET BC-007-T Tahoe bouillon cup has a 4-inch diameter, 2.25-inch height, and 8-ounce serving capacity. Serving capacity of 8 oz. Rim-full capacity of 8.6 oz.